Your plot deck and draw deck can only include neutral cards. 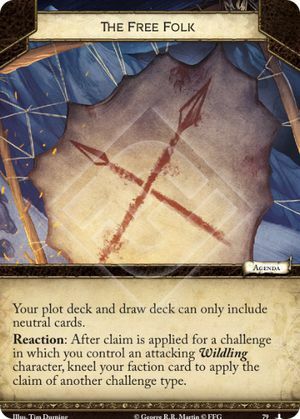 Reaction: After claim is applied for a challenge in which you control an attacking Wildling character, kneel your faction card to apply the claim of another challenge type. This challenge is in addition to the claim of the challenge you won, not a replacement. Effects that modify claim for a challenge (e.g. Trial By Combat, Vengeance for Elia) cannot be used on a Free Folk trigger. Effects that modify the claim value on your revealed plot during a challenge (e.g. Burning on the Sand, Muster the Realm) will also affect the claim from Free Folk if the agenda is triggered during the challenge(s) during which the affect applies. Effects that modify the claim value on your revealed plot during a certain type of challenge (e.g. Calm over Westeros, The Spider’s Web) will affect the claim from Free Folk if the agenda is triggered during that type of challenge, regardless of what type of claim is chosen. They will not affect the claim from Free Folk if triggered during a different type of challenge, regardless of what type of claim is chosen. For example, if your opponent reveals Calm over Westeros and chooses military, if you were to win a military challenge and trigger Free Folk to make them satisfy intrigue claim, the claim value on your plot would be reduced by one. However, if you win an intrigue challenge and trigger Free Folk to make them suffer military claim, the claim value on your plot will not be reduced.